Although I’ve been traveling around the world for the past 6 years, my path to this journey wasn’t an escape from a cubicle. Prior to setting off I developed a framework to focus my travels but in many ways you could say I fit a certain mold for this kind of extended adventure. I began in my 20s and am male (except when watching Finding Neverland) but my live chat guest today proves you don’t have to fit a template to follow your dreams. After 35 years in careers that paid the bills but brought no joy, Barbara Weibel set out on a 6-month round-the-world trip to pursue her true passions of travel, writing and photography. 7 years later, she is still traveling and writing about her adventures on her blog, Hole in the Donut Cultural Travel. 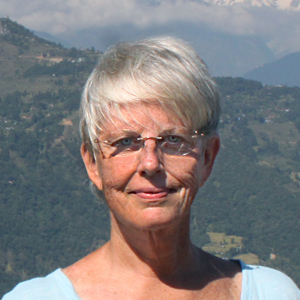 Barbara will be joining us for three hours today to answer any of your questions about the thrill and difficulties of leaving a long, established career behind to travel the world solo. Also, my friends at Sucre will send the person with the highest voted question or comment your choice of their 15 piece Macaroon, chocolate collection ($32 values), or king cake ($20 value; shipping US-only). We’ll see you in the comments below! Hello everyone, Barbara and I will be by live later today, but you can begin submitting your questions right now. They’ll be visible once we get started later today, live from 3pm-6pm US EST. Hi Deniz: Interesting question. I’ll soon turn 62 and I’ve been traveling since I was old enough to set off on my own (17). I have often thought over the past 7 years that I get a lot more respect as an older woman than I ever did when I was a young woman. Frankly, I rarely feel challenged when traveling, but I think that’s because I’ve become so accustomed to going with the flow and being flexible when confronted with problems. When faced with being lost, for instance, I always ask myself what’s the worst that can happen. And my answer is always I can hail a taxi or knock on a door for help. I’ve found that people all over the world are more than willing to help and most people are good. That said, I also have a finely tuned radar. If I feel uncomfortable or in danger of any kind, I extract myself from the situation, even if it means being rude. Hi Rita: There’s no hard and fast answer to your question, because everyone likes to travel in a different way. I have a sister, for instance, who thinks roughing it means staying in a hotel where they don’t turn down the sheets and leave a chocolate on your pillow each night 🙂 But I’m a pretty intrepid traveler and I always thought accommodations weren’t that important. I don’t spend too much time in my room, so why pay a zillion dollars for a luxury hotel room. Plus, I really love the energy of hostels. Sometimes I stay in the dorms, sometimes I get a private room, but hostels always let me meet fascinating people, many of which have become lifelong friends. And though they range in price, on average I’m paying about $17 per night, which usually includes breakfast. I generally stuff an extra buttered roll and some cheese in my pocket for lunch, which means I really only need to buy dinner. And I’ve found that even in the most expensive places, there are ways to eat cheaply. Case in point: Paris. The restaurants were exorbitant, but the bakeries all offered pizza and quiche, which made a great dinner. Thus, my biggest expense is airfare, and I do pretty well with that because I’ve signed up to receive the newsletters from every airline I know, so I just watch for the sales. I see. I just don’t know where I would begin budgeting such a large trip. I understand Rita. It’s really frightening the first time out. I try to stick to an overall budget of about $30 per day, including accommodations and food. Then add in the cost of activities and attractions you want to visit, and transportation. Hope that helps. What country have you felt most free in? Hmmm…really a hard question Yilmaz, only because I think freedom is a subjective term. I’m eternally grateful to be a U.S. citizen, because it’s one of the greatest passports in the world. I can travel to most countries without getting an up-front visa. But though we have freedom of speech, etc., we also have a lot of laws, rules, and regulations that impinge on our freedom. On the other hand, I visit many third-world countries where there is limited rule of law that makes me feel free (I can do pretty much whatever I want), but I’m aware that the horrid level of corruption in those countries keeps people oppressed, in despair, and in a state of poverty. Frankly, I go ’round in circles on this one. What’s the most expensive country you’ve visited? Have you encountered major problems traveling in any countries? Were the problems related to being a woman, being a tourist, or being at your age? Do you recall anything specifically that made you feel wary about this specific campground? Being a recovering addict myself, I clearly saw evidence of a drug culture but I stupidly ignored it. However, there was that little nagging voice that I just couldn’t equate with any visible signs. I just knew it wasn’t a safe place. Stupid, stupid, stupid. Which countries have you faced the most problems in? Hi Wandering: Without a doubt, China was my most difficult and frustrating travel experience to date. I did not like the pushing and shoving mentality that is so prevalent, and I found it very difficult to communicate, even in places that normally have English speakers,like train stations. What are your major concerns while traveling?—Food? Cultural differences? Language? Lack of sleep? Communication problems-internet-cell phone? Hi Wandering: Food is sometimes a bit difficult because I’m a vegetarian, although over the past five years vegetarian food has become much more available. I’m pretty god with languages, so I’m almost always able to pick up the basics in every language (hello, goodbye, please, thank you, where is the bathroom, I need water, etc). There are some notable exceptions – I absolutely could not grasp Khmer in Cambodia, but strangely, I speak quite a bit of Thai. I thrive on cultural differences, because that’s what drives me. Probably the two biggest problems for me are making sure I have a decent wifi access and lack of sleep. There just aren’t enuogh hours in the day. Hi everyone, we’re ready to go and thanks for the questions to get us started. Hello Barbara! What have your recent travels been like and what’s coming up next in the near future? Last year was a whirlwind of travel. Because I focus on and write about culture, I tend to stay in places for a while to immerse in the local culture. However I also wanted to do a broad Eastern European tour to see if any of those countries were a potential for my “summer” home. As a result, I ended up visiting something like 12 countries in eight months, which was WAY faster than I normally travel. By the time I reached Thailand (which was my 2-month winter home), I was thoroughly exhausted. However, I did find places in Eastern Europe that were tremendously intriguing. I visited some wonderful off-the-beaten-track destinations in Hungary and Romania, but Bulgaria was the place that most captured my heart. It is truly an undiscovered gem and should be on everyone’s top ten list, in my opinion. This year I am scheduled to leave on March 1st. I’ll be starting off in Dusseldorf, Germany, where I’ll attend their Winter Carnival and ride of the Tourism Bureau parade float. Then I head to Tromso, Norway, for a 4-day cruise with Hurtigruten. They are a fascinating cruise company because they began life as a fleet that delivered supplies and mail to the northernmost towns in Norway, week in and week out, all along the Arctic Coast to Russia. These days they still perform that function but they also have passenger cruises. Fingers crossed that I’ll get to see the Northern Lights, an experience that has long been #1 on my travel wish list. After that, my tentative plans call for Italy’s Amalfi coast, Sicily, Malta, Albania, Montenegro, France, Spain, Croatia, and Slovenia. But of course, that’s only a rough itinerary; it will change a hundred times as I wander – it always does. Bulgaria too is one of my favorite countries and am still amazed not many more people visit there. It should be higher on many travel lists! Yes – it’s been WAY too long since we got together. Hope to do it again soon – we almost mad it work in Romania! You’ll have to let me know if you think our itineraries might mesh this year. Absolutely! I’m in a writing phase (as you know how that goes very well) but will put together plans soon. I don’t recall, were you able to make it to Sibiu? No, unfortunately the food poisoning I got in Brasov was so bad that I cancelled some of the paces I wanted to see and just rested Also really sorry I missed Sighisoara! Guess it’s a good excuse to return. What lead you to this decision? Hi Bilal: It was a long process. I spent 36 years in corporate life at jobs I detested, for all the wrong reasons. I was trapped by fear – of not having enough money to live, of what my friends and family would think if I walked away from my successful career to wander the world, etc. I sold my soul because I needed the approval of others. And I was miserably unhappy. Then I got really sick and it took the doctors 5 years to arrive at a correct diagnosis. By that time, I thought I was going to die without ever being able to do all the things I’d always dreamed of. When they finally diagnosed me with late-stage chronic Lyme disease I was crawling between the bedroom and bathroom and I made a vow to chuck it all and pursue my only true passions of travel, writing, and photography, if I recovered. It took a year to regain my health, but I kept my promise to myself and never looked back. And the rest, as they say, is history. What did you do before traveling? Hi James: I held various sale, PR, and marketing positions in large corporate entities and smaller corporations as well. I worked in real estate, aviation, development, public relations, advertising, and a chemical recycling facility, among others. I had about a ten-year attention span before I grew bored and began looking for the next challenge. I haven’t hit boredom doing what I do now – anything but! However, I think that’s because I’m finally doing what I love. In 3 years do you think you’ll want to do something different? LOL James. I come back to the US to spend Christmas with my family and stay with my Dad for a few weeks before hitting the road again. Last week he asked me how long I think I can keep on doing this. He’s 88 and, though he’s come to accept my nomadic lifestyle, he still doesn’t completely understand what I do. I told him I expect I can keep on traveling for at least another 10 years, when I’ll be 72. However I do expect to be making some slight changes over the next couple of years. I really don’t like being cold, and I’ve discovered how much I DON’T like crowds, so my long-term goal is to find someplace warm where I can stay put during the three winter months and another place where I can spend the high season summer months of July and August. The rest of the time, I’ll continue to wander as I do now. Happy to James – thanks for asking! What’s been the most difficult country to travel in as a vegetarian? That’s a tough one, Anil. In the beginning, I’d have to say being on safari in Tanzania was particularly difficult because they had absolutely no concept of a vegetarian diet. I think I ate lettuce and tomato sandwiches with maybe some cheese for a week. But it might be tied with China – not because there isn’t vegetarian food available, but because of the language barrier, which was horrible. And even with a translator, they just don’t understand vegetarianism. They think it means no beef, so I often got served chicken or pork. This is a difficult situation as I try not to eat meat as well. Though in such cases I’ll usually succumb to my hunger if there’s a misunderstanding; I know others who won’t though. I’m a big fan of your photography Barbara, was this a skill you learned along the way or prior to the beginning of your long term travels? Thank you, Anil! Photography was my first love. My uncle gave me an old Leica rangefinder camera with ground glass lenses when I was 11 or 12 and from that day forward, you couldn’t pry it out of my hands. I think I pretty much bankrupted my lower middle class family with film developing. At the same time, someone gave my Dad a subscription to National Geographic and he never threw a single one away. They sat in the front hall closet in stacks as tall as me, and I would sit cross-legged on the floor reading them for hours on end. That ignited my passion for travel and for years I wanted to be a photographer for National Geographic. Now I’ve got the best of all worlds, because I get to take photos and travel AND I’m my own editor. So I choose where I go, what I do, and what I will write about. Interestingly, Istanbul was a difficult shoot for me. It’s true what they say about the quality of light. Some places just have better light than others (like Venice, for instance). For me, the light in Istanbul was difficult and I’m still not sure why, so I’m glad to hear you like my photos from there. 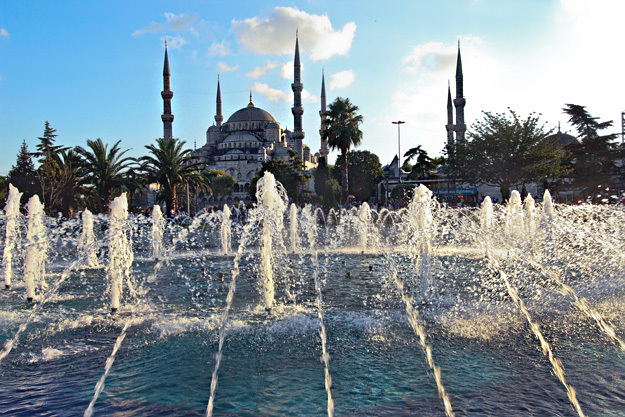 Overall how did you find Istanbul – I’m curious to hear your impressions. I absolutely loved Istanbul. I think the hostel where I stayed – Second Home Hostel – was a big part of that, because the owners and staff were so warm and welcoming. But even without them, the city is wonderful. Turks are a gracious, warm, welcoming people and I wish I’d had more time to visit other areas of the country as well. It’s one country I’ll definitely return to, and as a bonus, the dollar is buying more and more Turkish Lira these days. I’ve stayed there as well! I try to have a few days in a new hostel each time I’m in Istanbul to get a wide idea of them in the city and Second Home Hostel was one of my favorites as well. For the same reason, great staff (and breakfast as I recall). OMG…my mouth is watering just thinking about their breakfasts! Rolls with creamery butter, Greek olives, hard boiled eggs, sliced tomatoes and cucumbers, cheese, Turkish coffee, juice. Yummm. A good comparison up the road a bit in Sultanahmet is Agora Guesthouse. Excellent hostel with a great breakfast as well. What is one thing you would have done differently before leaving behind your job and setting off to travel the world? JJ, I guess the #1 lesson is always be aware of what is going on around you at all times and pay attention to your gut. When we travel, we’re in unfamiliar territory, so it’s especially important to employ your radar. Never, never, never ignore that funny feeling in the pit of your stomach that tells you something is not quite right. Do you ever regret the decision to do what you did? What is the biggest downside, or anything you wish you could take back or have not done? Not for one second, Pam. I have absolutely no regrets about the lifestyle I have chosen, however I do wish I hadn’t waited so long. I’m an avid hiker and walker and at my age I’m starting to feel a few ached and pains in hip and knee, so it’s a little scary to think of the day when I might no longer be able to do mountain treks, etc. But I’d do it all over again in a New York minute. I’m terrible at taking videos – aside from being a bit lazy about it, I’m often reluctant to look ‘strange(er)’ than I do when traveling in public! You’ve got a good number of high quality videos on your YouTube page, how do organize yourself around video? I was dragged, kicking and screaming, into video. It was not a talent I had, nor did I have any idea how to edit a final product, but blogs that feature videos get lots more readership than those that don’t, so I bit the bullet and trained myself, as I’ve always done. The biggest problem when shooting video is that I do it with my Canon DSLR. It gives me HD quality, but I find when I’m shooting video it’s difficult to switch to photos and back again. Basically, I decide ahead of time whether the place is going to be a video project or a still project, and pretty much stick with one mode. Editing, though I’ve gotten fairly proficient at it, is a horribly time consuming process. The best I’ve ever done is two hours to produce a video; some take me up to 8 hours because I have to put together clips, add titles, do voice-over, and render. But it does pay off. I’ve got several videos with many thousands of views, and one with more than 150,000 views. A question via email from reader Jen who wants to know what types of electronics you carry around the world? Oy! Way to much. It’s always a balancing act, because the electronics cannot be checked through due to their high value. Every bit of equipment is on my back, in a pack that weighs between 20-25 pounds. Not only is it heavy, it’s also a big problem when flying the discount airlines in Europe (Ryan Air, Easy Jet, Wizz Air), because they limit carry-on weight to 10 kilos (22 lbs), so I constantly have to shove things in my coat pockets to stay under-weight. At the moment I carry a MacBook Pro with charger and backup charger; two unlocked iPhones and chargers; a 2 Tb external backup hard drive; a Canon DSLR camera with three lenses, two batteries, charger, half a dozen storage cards, two filters, and a special carry strap that takes the weight off my shoulders; two USB thumb drives; sim cards from a variety of countries that I often go to; a wifi antennae extender; headphones; and all the ancillary cords that one needs with this stuff. There may be more, but it escapes me at the moment. Jen, who is apparently comment shy (I’ll get you to leave your own chat questions one day!) also would like to know how you secure them and your favorite meal. Well, I make very sure that any hostel I stay in has individual lockers for each guest and I carry a combination padlock (no key) with which to secure the locker. My electronics get locked up whenever I leave. I also follow a protocol with regard to the laptop and external hard drive. If for some reason I’m carrying the laptop in my day pack, the external hard drive stays locked up in the hostel, and vice versa. That way, if one gets stolen, I still have the other, so I’m not at risk of losing all my data and photos. My favorite meal…hmmm. Can’t choose one so I’ll have to give you two: Pad See Ew in Thailand (wide rice noodles in a brown sauce sauteed with vegetables) and a Thali platter in Nepal, which is served in aa big metal plate with partitions that contain a sculpted pile of rice in the center, surrounded by curry veggies, a spinach of some sort, raita sauce, pickle of some sort, fresh cut tomatoes and cukes, and a papad (like a tortilla chip only larger and thinner). I never know if this is an appropriate question, but how do you pay for your nomadic lifestyle? Thank you! It’s an entirely appropriate question Kira. I had saved some money from my years in corporate life, but didn’t have a lot because I walked away from my career just about the time the real estate market crashed. It was enough, however, to pay for my first six month round-the-world trip. I started the blog on a whim, so that my family and friends (who were literally freaking out about my decision) could follow me around the world and feel comfortable that I was OK.
By the time I returned I had about 1,200 readers each month and I decided to see if I could make a business out of the blog. It’s not been easy, simply because blogs were an emerging technology. Seven years ago when I started, hardly anyone knew what a blog was. But I took the leap of faith anyway. My blog began to earn enough money to keep me on the road about two years after I launched it, which was just about the time my savings ran out. Today I earn money from a combination of advertising, photography sales to publications, freelance writing, and other media related jobs. I’ll soon be publishing my first ebook, “Nepal for Non-Trekkers,” which I hope will add a few dollars to the pot. Finally, because my blog has a fairly high readership, I’m often hosted on trips by hotels, Tourism Bureaus, etc., which keeps my costs lower. However I don’t like to do a lot of that, because there’s always the possibility that I won’t like a place, and then I’m in the undesirable position of having to write something negative when my hosts have paid for my travel. Though it’s uncomfortable, I always tell the truth. In most cases, I prefer to stay in hostels, which are inexpensive and great fun because of the camaraderie of the guests, and then I ‘m free to do what I want, and write about what I choose. How do you see the end game? Where will you be when you stop traveling? Hi Mike: I’m afraid that’s one question I can’t answer. I make it a practice to stay i the present moment as much as possible, because if I’m regretting the past or worrying about the future, I miss what’s happening in the present. At the moment, I can’t see myself ever living in the U.S. full-time again. I much prefer the cultures of parts of Asia and Europe, which seem to be much less materialistic than we are. So, I take it day by day and see what each tomorrow brings. Gosh, Anil, there are so many stories that I haven’t yet written. There’s my trip to one of the remotest areas of Thailand with a group of Yogis, a spectacular wilderness area with wild elephant, primates, and leopards where I stayed on bamboo hut that floated on a lake. There’s my spur of the moment visit to Xcalak, Mexico, where I ended up staying in a guest house managed by a nudist couple. There’s the story about a visit to a night market in a tiny village in Madhya Pradesh, India, where the people had never before seen white people; what started as a lovely experience ended in a near riot because thousands of people wanted to touch us. And I’ll soon be writing about my amazing experience of waking through the hills with a herd of elephants in Northern Thailand. I’m so blessed to be able to do the things I do and so grateful for people like you who help me promote my blog and for all the readers who are so faithful. It was great fun Anil. Thanks for inviting me. John, if you’re anything like me, you’ll be blown away by the spiritual side of India. Yes, you want to see some of the top tourist sites, but be forewarned that you’ll also find those sites chock full of very aggressive touts that sometimes make the experience stressful. When you’ve had your fill of top tourist sites, I encourage you to try to find a way to connect with some local people. You’ll find Indians wonderfully warm and caring. They have a saying in India and Nepal – “Guest is God” – and they take that very seriously. I’m not sure if it’s a rude question to ask or not but does not being a typical backpacker age change how you travel or how people approach you in hostels? Thank you for helping my curiosity. It’s not rude at all, Rémy. Years ago, hostels were called “youth hostels” and were almost exclusively the domain of the young backpacker, but things have changed. I’ve shared dorm rooms with people of all ages, including an 80-year old woman who climbed into the bunk above me in a remote town in Mexico. In almost all cases, I’m warmly welcomed. Once in a great while I land in a hostel that is really “young” and, though I’m not uncomfortable, I wonder what the other guests think about me. That happened to me a couple years ago in Barcelona, at St. Christopher’s Inns, another of my favorite hostels. The third morning I had breakfast with five or six other young women, all in their early twenties. Of course, we all shared our stories and, as so often happens, they were very intrigued by what I do. At one point I looked around the room and commented that I must be the oldest person in the hostel. As we were all leaving, one of the women said, “I don’t know if you’re the oldest person in the hostel, but I can tell you this – you’re definitely the most interesting.” That’s the kind of reception I get all the time. And it’s good for me too. I love being around young people. I love their energy and it helps keep me young in mind and spirit. That being said, I should mention that there are some hostels who don’t welcome guests over 40, and that is always stated in their restrictions on the booking sites, so be sure to check for this when booking. Hi Murat: I’ve been to 48 countries so far. More than half of Europe, all of the U.S. with the exception of 5 states, most of Mexico, Peru, Ecuador, Honduras, Costa Rica, various places in the Caribbean, South Africa, Morocco and many of the countries of East Africa, everywhere in SE Asia except Myanmar (which I will remedy this year), Nepal, China, Canada, Australia, New Zealand, Indonesia, etc. Do you have a favorite country ? Always a difficult question, Ron. I have a few, and I like each for a different reason. I’d have to say that Thailand, Nepal, Bulgaria, and Mexico top my list. How do you plan and envision your old age. I imagine any treasured heirlooms are with your father? Is it really possible to get rid of everything? Nurit, I never envision myself as old. I think old is a state of mind.Of course, my body might well give out before my mid, but I’ll cross that bridge when I get there. I do have a few sentimental items stored in my father’s home. Some artwork, my rock collection, photos, financial records, a few trinkets – but that’s all. Getting rid of all the material stuff in my life was like having a heavy burden lifted from my shoulders. We need so much less than we think we do. I travel the world for 10+ moths per year with nothing more than a small backpack and a 22″ carry-on suitcase. As for budgets, it’s really hard for me to make a recommendation because, as I’ve said here a bit earlier, everyone has a different mode of traveling. I encourage you to look into hostels, because they are n longer only for the young (see my extensive reply in the thread above). But if you really don’t like hotels, you can usually find small guest houses as well. I travel on about $18,000 per year. It means I have to be very budget conscious, but it’s entirely doable. And now a seemingly superficial question. I am traveling now and cannot get straight the intricacies of hair management. I look like a mess. How d you manage to stay looking so attractive and presentable? LOL – I have my hair cut as short as possible and don’t even carry a hair dryer or a brush. A comb and my fingers work just fine, Nurit. Thank you for the compliment, BTW. Barbara, how are you liking the chat so far? Amazing, amazing, Anil. Such great questions. But boy are my fingers tired! Are there any places you won’t go or have no interest of visiting? Not that they would be bad or anything but like seem boring or something..
Hi Kat: Yes, I use a modicum of common sense because, after all, I am a solo female traveler. Though I’d love to go all these places in the future, right now I won’t consider Afghanistan, Pakistan, Syria, Lebanon, and Egypt, altough the latter is getting close to being acceptable. would love to find a ‘tour’ yes i hate that word, group that could offer enough security for solo travelers to visit places in the world that are important to visit…. I’m not much of a “tour” person, Lee, but I have taken several. Most I’d never do again, but I took one with Tauck and think they are an excellent company! Hi everyone, I almost completely lost track of time. But unfortunately our time is up and want to thank you Barbara for spending part of your day with my readers and I. It’s been a wonderful chat and I hope you’ve had just as much fun. You can feel free to come back to the thread if you’d like to follow up with anyone. 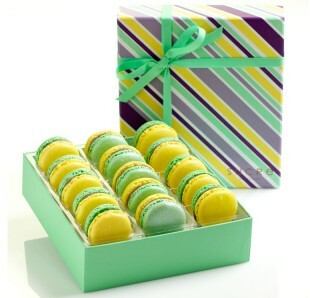 Lastly, I’d like to thank Sucre New Orleans for being generous and sending Kira (who has the top voted comment thread!) her choice of their 15 piece Macaroon, chocolate collection, or king cake. I’ll be in touch soon. Thanks again everyone and happy travels until next time when Sean Keener stops by to answer all of your questions about booking RTW tickets. question: what is considered a ‘good number of readers’? i need travel departments to answer my emails! You’re in the right place Lee but a bit late unfortunately as Barbara is no longer live on the thread. She might though come back and check for follow up questions. Thanks for your questions. Hi Lee: There is no hard and fast rule on this. I started earning income and being invited on press trips when I had about 7,000 monthly readers. However I think there is a recent trend to consider blogs with lower readership, but that serve a niche market. For instance, a log that writes mostly about cruises is likely to have a readership that is more interested in cruising, so they might be more interested in reaching those readers. blogging question: do you have a sample letter of a request for travel support: either for information or even for sponsorship …..
what is your opinion on doing guest blogs? I don’t have a template letter for these type of requests, Lee, because every situation is completely different and I really feel it is better to write a personal letter to each and every tourism bureau. I’ve also developed a Media Kit in an Adobe Acrobat pdf format that I send along. It gives them all the info they need to make a decision : monthly traffic, social media numbers, demographics, etc. I don’t accept guest posts on my blog because I’ve spent seven years and a good deal of money to develop the blog in my voice, and I feel strongly that allowing anyone else to write would be inconsistent. I’ve done a bit of guest posting over the years, but mostly my blog keeps me so busy that I don’t have time to write for anyone else. There’s also another issue to consider. Guest posting used to be quite pure, but over the past year or so it’s become just another way for companies to get artificial links to their websites in order to try to influence their ranking in Google. Google has recognized this and just a couple of weeks ago came out with a video stating that this type of guest posting should not be done. I think it’s a pretty risky activity at this point. I’m not going to take the chance that Google will penalize me or even de-index me for a few links. any suggestions on best web sites to find apts for long term travel? There are actually lots of options in this regard. Vacation rental companies often offer properties by the day, week, and month. I’ve even seen some by the year. Try HomeAway.com, GowithOh.com, or Wimdu.com. since you dont plan (as per your message below) to return to the USA, do you have something like a ‘guardianship’ set up? i am working on a system to manage my taxes, transfer of funds and even burial (if that happens) while on a long term trip….9monts or more..
No, Lee, no guardianship or anything like that. I do have a will, but that’s all, and it certainly doesn’t address repatriation of remains if I die overseas. But everything else you mention is quite simple. I pay all my bills online, and use an ATM to get local currency when I arrive in each country. You just need to use a U.S. bank that can give you a Visa debit card attached to a checking or savings. The big benefit of this is that the bank will give you the best currency exchange rate possible, you’ll pay no foreign transaction fees, and most banks allow several ATM withdrawals without bank fees. I keep all my receipts and invoices in electronic form so I don’t have to carry paper, which allows me to prepare tax documents for my accountant electronically, and he has a power of attorney to file for me and represent me before the IRS, should that become necessary. Hi ma’am, I saw your blogs. My classmates and I are now currently conducting a study about perpetual traveler. It’s our thesis topic. Is it okay if we interview you just a few questions? It would be a great help to us. Thank you!